· STAINLESS SHEET STEEL BODIES. · OWN PRODUCTION OF BLADES, UP TO THE PRESENT DAY. · MANUFACTURE OF THE FIRST SINGLE-PHASE MOTORS. · MOTORS WITH AUTO-VENTILATION SYSTEM. · CREATION OF THE AUTOMATIC STOP/START SYSTEM OUT OF THE DOSER. · DESIGN OF THE FIRST GRINDER WITH AN ALL ABS BODY. THE PASSION EVERY DAY TO EXCEED OURSELVES THROUGH TALENT, THE KEY TO SUCCESS. 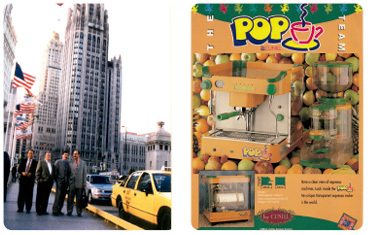 Pere Cunill was an entrepreneur advanced for his time. 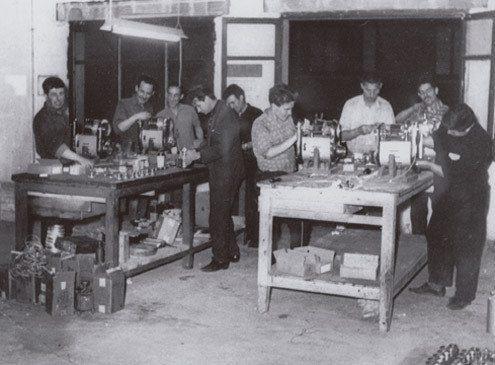 After various forays into different sectors, at the beginning of 1957, he created TALLERES CUNILL, a company dedicated to the manufacture of parts for the Gaggia brand of coffee machines and grinders. 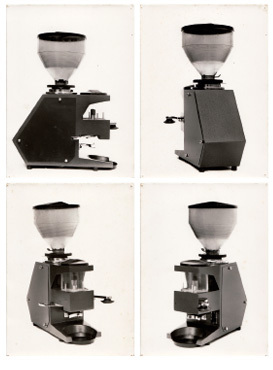 In 1957 Molibar, Bambi and Dosibar coffee grinders saw the light, three spectacular historical examples, hand moulded, cast in sand and equipped with glass dosers and hoppers. With Gaggia, Talleres Cunill produced 200 grinders per month. 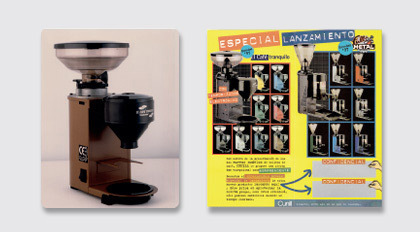 At the height of the seventies, Pere Cunill began to manufacture his own coffee grinders. Tauro was the first of a series which would revolutionise the sector. 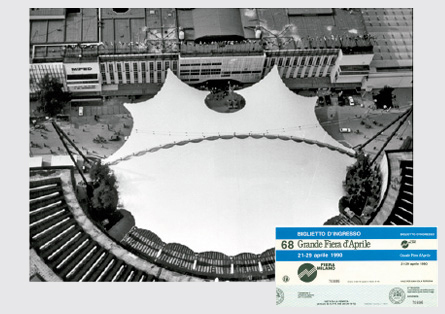 During that decade and the following, their production reached more than 1.200 grinders per month. His passion to exceed himself day after day and his fascination for new technologies, led Pere Cunill to develop the first stainless sheet chassis, less heavy and 30% cheaper. He was also a pioneer in manufacturing plastic injection parts (hoppers, star pieces, dosers...) and grinders with chrome-plated feet. Since 1983 and until the present day, Cunill is the only national company that manufactures its own blades. 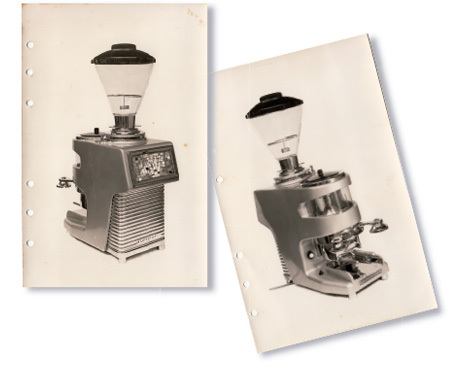 Pere Cunill designed the first self-ventilated single phase motor, revolutionising the world of coffee. 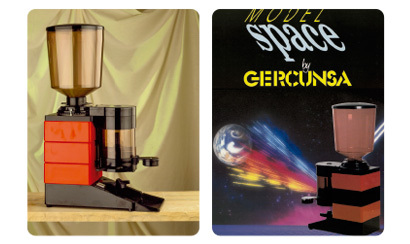 At the end of the 1990s, he presented the first professional grinder with an integral ABS body called Space, the only one in the world with these features. Pere Cunill still had time to develop the first two-piece doser in ABS and started drawing the first studies for the silent grinders. 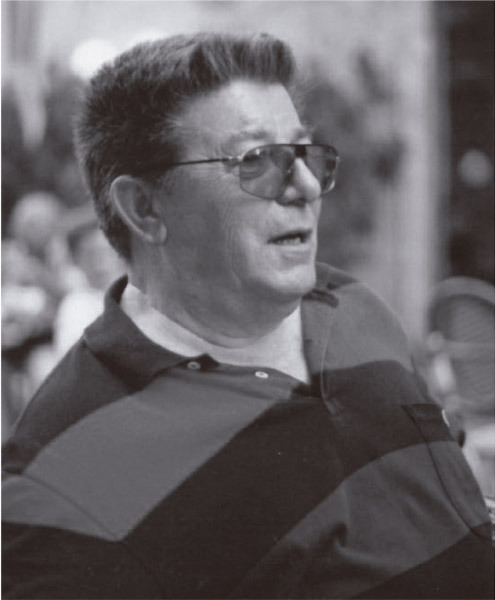 Pere Cunill left us in 1997, but the company he founded has continued believing in and promoting his values with energy day after day. Three spectacular historical examples, hand moulded, cast in sand and equipped with glass dosers and hoppers. Designed and manufactured entirely in the Cunill factory in Manresa. Pere Cunill founds TALLERES CUNILL in 1957 at Manresa (Barcelona). The company is initially dedicated to the manufacture of parts for the catering sector, coffee machines and professional coffee grinders. 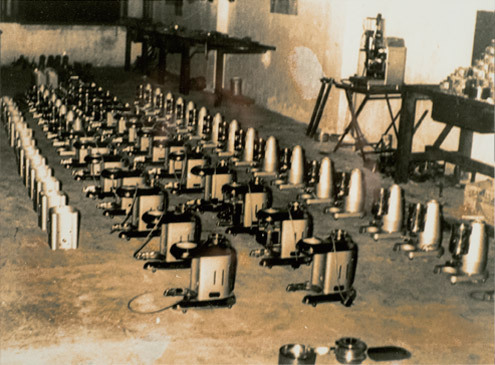 Sample of some coffee machines manufactured at the Talleres Cunill. 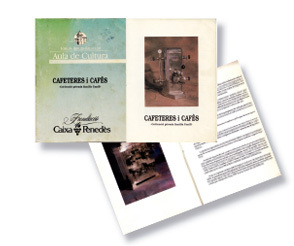 In a few years, the manufacture of grinders gained ground within the Talleres Cunill, to the point of finishing the manufacture of coffee machines. 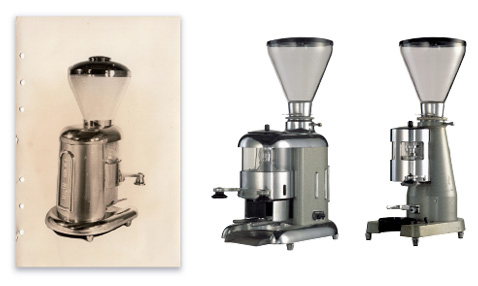 In the mid-1970s, specialisation leads Cunill to the leadership of the national coffee grinder manufacturers. 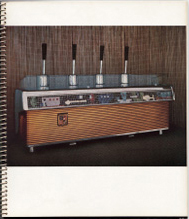 1965 The Molibar - Italcrem - Semi-automatic grinders are adapted to the line of coffee machines with the characteristic mosaic of coloured stones forming part of a new line which was well received. Host. Salone internazionale dell'ospitalità professionale. 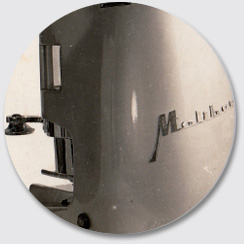 1968 The Molibar C coffee grinder is born. A semi-automatic product with a one-piece metal body and a large capacity doser with its characteristic glass windows. 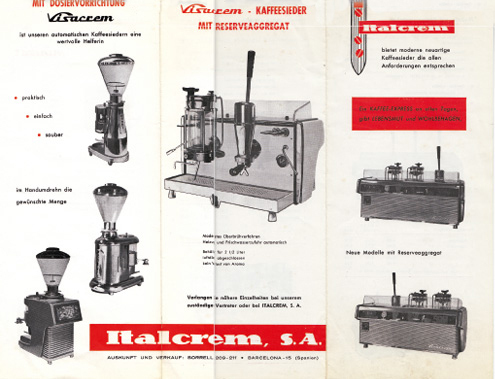 1967 The first coffee grinder, fully designed and manufactured by Talleres Cunill, is released onto the market. The economic difficulties caused by the failure of its main clients, lead Cunill to make a 180° turn and to re-found the company in a new factory in Sils (Girona). With the intention of "starting again from scratch", the ANTIGUOS TALLERES CUNILL, S.A. "ANTACSA" company is created. The generational family business gives a different perspective to the manufacturing processes, providing a high technical input at each of the manufacturing stages. The production of 1.500 grinders per year rises quickly to 2.500. Tauro, Mixto, automatic, semi-automatic, lever... are some of the 10 models of professional coffee grinders that brought great advances to the market and were part of the brand's production line during the 1980's. Antacsa (Antiguos Talleres Cunill, S.A.) and Gercunsa (Germans Cunill, S.A.) are part of the transformation of this large firm of Cunill. Cunill takes part at the most important international exhibition of the hospitality industry, FERIA MILANO. A great event for the Cunill family and a recognition of its development. 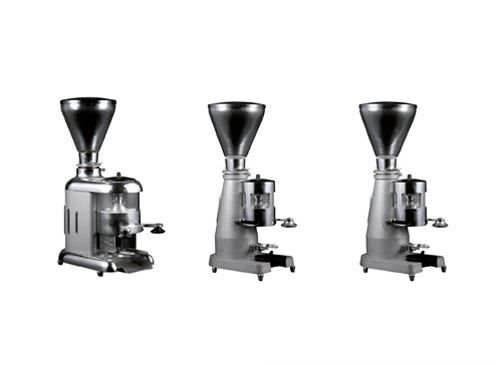 Presentation of the first plastic coffee grinder SPACE (worldwide new) with the distinctive feature of incorporating a square format modular design in order to be able to grow without the need to make new moulds and thus achieve a very competitive final cost. It also incorporates the first entirely plastic two-piece doser. Following the success in the domestic market, foreign promotion bears its first fruits and it begins to export to Germany, Belgium, France, England and Portugal. 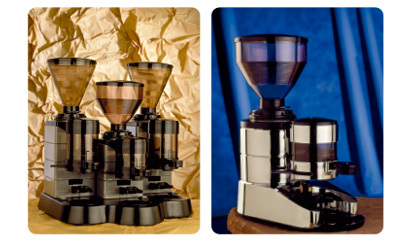 At the end of the decade, the production is approaching 8.000 grinders a year, with a range of 5 different models. Second participation at the important FIERA MILANO. The manufacturing processes continues its evolution, the introduction of new materials makes them abandon the traditional vision of coffee grinders entirely. The product range is expanded with the Brasil and Marfil model, with a round and modular body, and the double and triple models like Costa Rica, Mexico, etc. 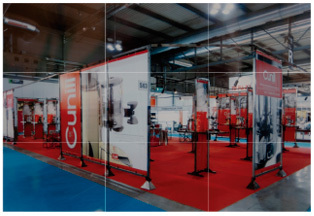 CUNILL is once again present at the Italian trade fair, FIERA MILANO. The priorities are now stabilising the product range and foreign sales, so tours of prospecting potential distributors in the countries of Europe and America are undertaken. 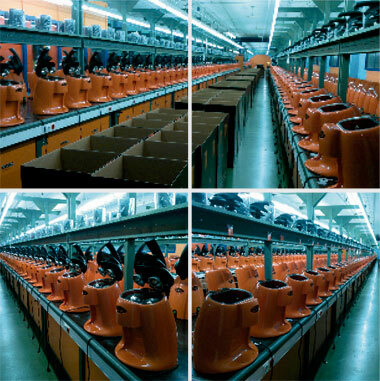 The production of coffee grinders by Cunill continues to grow up to 12.600 annual units. 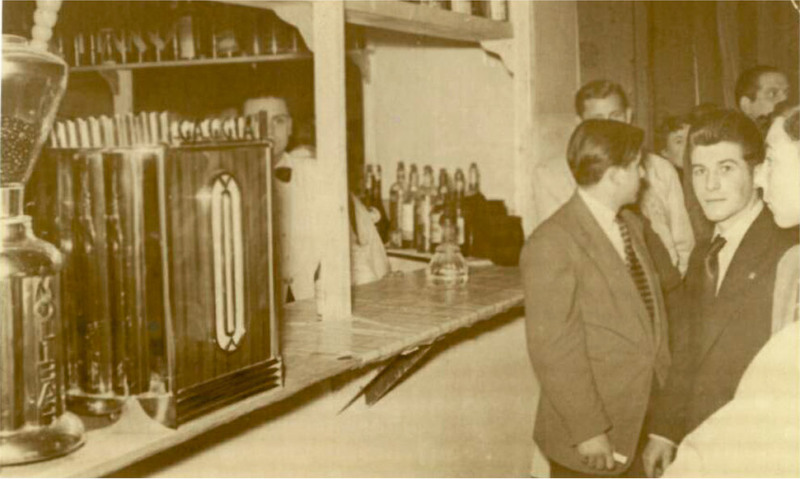 First exhibition, in Barcelona, of the private collection of centuries of coffee machines by the Cunill family. 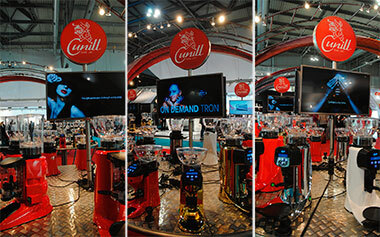 The good results at past editions of FIERA MILANO, lead Cunill to attend for the fourth consecutive time. Foreign promotion focuses on the U.S. market and Cunill participates for the first time at the Chicago Fair, NRA. Exports to the American country (North and South America) expands with the production of specific models for these markets. Once the range of models is established meeting all the needs of coffee professionals, it is decided to bet on the design. The range of POP grinders is born, made of transparent materials, following the latest trends of the time. 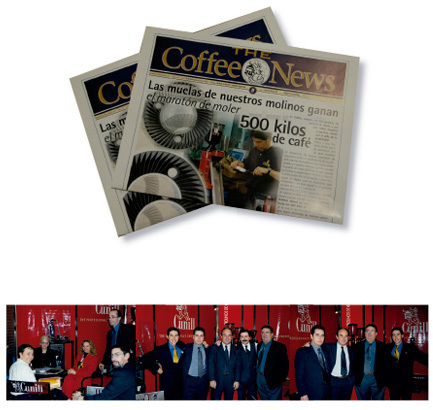 Cunill begins a grand communication strategy with publications such as the newspaper "COFFEE NEWS" which brings together all the news and developments generated by the company. Presentation at the FIERA MILANO of what would later be an espresso machine with an integrated grinder. Cunill repeats its success at the NRA Fair in Chicago. 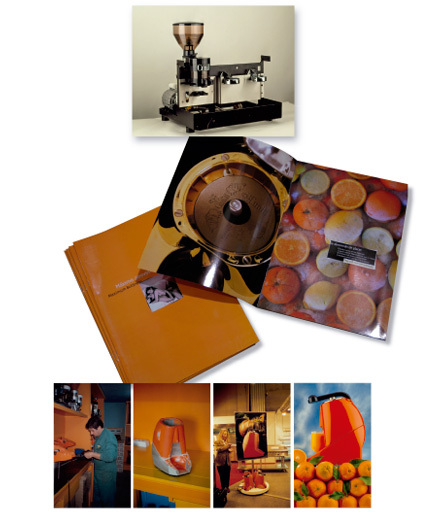 The company decides to diversify its production introducing the ACID ONE, a professional orange squeezers which, through its design and technology, breaks with all that had gone before. 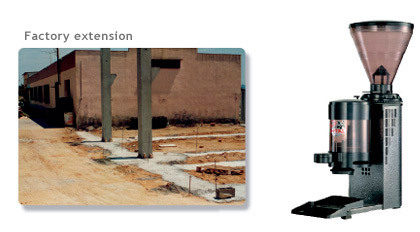 The production of this new product demanded an extension of the production area by 500m2. A "first aid kit" was launched; "First Aid Set" for coffee grinders maintaining, later, also available for the squeezers. 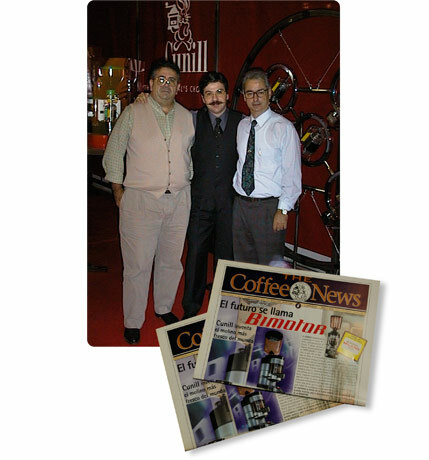 COFFEE NEWS publication continues to inform customers of news, operation tips and quality tests of the brand. The annual production reaches 16.800 coffee grinders. 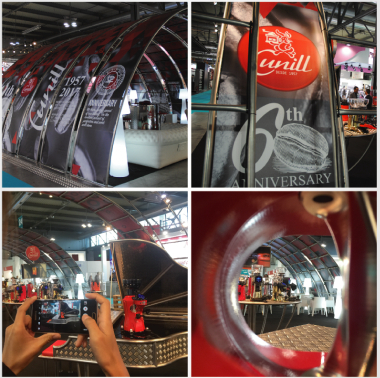 Cunill is present at the EXPOMILANO fair. The range of products has now reached 11 models, expanding to 13 with the 'Full Metal' and a new grinder only for decaffeinated coffee, El Café Tranquilo'97. This year more than 18.000 coffee mills are manufactured. 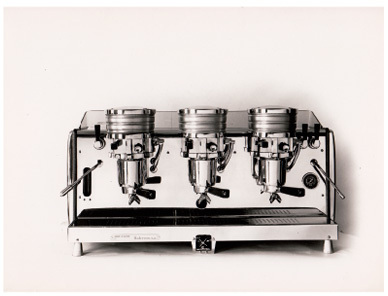 The Cunill family has been collecting different machines for coffee from around the world, buying and restoring pieces that illustrate the recent history of coffee in the catering trade. 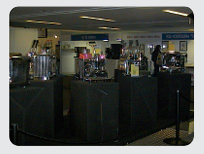 The FIRA DE BARCELONA asks the family to exhibit their private collection of vintage coffee machines at HOSTELCO. 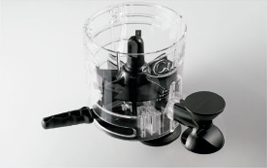 Faithful to its policy of listening to customers, Cunill designed and patented the DIRECT INTAKE, the gasket-saver which eliminates all the usual problems with groups of coffee machines, protecting the rubber seal of the group. A genuine innovation that is applied to all its grinders. At the same time, the "CRD" (Cunill Research&Development) develops the new NOBEL, the first silencer (65dB) coffee grinder in history. This year Cunill acquires new industrial units and extends its facilities by more than 5,000 square metres. 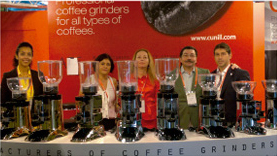 The new quiet grinder NOBEL 65dB and its future application to the rest of the range is presented at EXPOMILANO 1999. 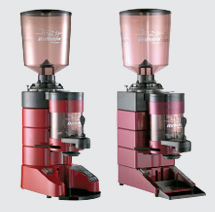 The product range is doubled to manufacture all the grinders with the silent system. Silent models such as the Ethiopia, Jamaica and Uganda are born. The new twin-motor model, for very large-scale production, is presented which leads the CRD to develop an ambitious test of mechanical strength never before performed, with 500 kilos of coffee. Exports are expanded with a significant presence in Russia and countries in Asia, raising production above 25.000 grinders per year. New presence at FIRAMILANO. 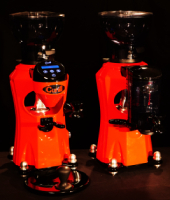 Cunill widens the product range with new grinders that improve the performance of some existing models: HAWAI-2, for bagged ground coffee and TANGO, a grinder for cafes requiring large-scale and quick coffee production. The ACID ONE squeezer, manufactured entirely in plastic and in a variety of colours, is presented. 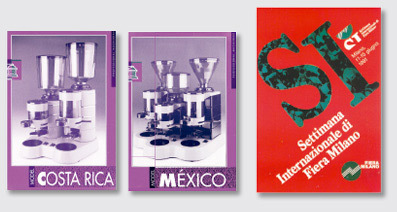 Exports to five continents raises production to 30.000 units, with coffee grinders and squeezers, annually. Once again, EXPOMILANO becomes the event of the year. The Cunill company beguins making the first contacts for the collaboration to develop parts for the grinders in China. The figure of 52.000 is reached for machines sold in a single year. Presentation of the new silent grinder, MOVIE 63dB. All Cunill grinders have the new doser made from a single piece of transparent unbreakable plastic, unique in the world. To celebrate the 50th anniversary of the brand four models, totally revamped with a spectacular and innovative design, are presented. In this way, the three collections ABS, CROM and INOX are updated. 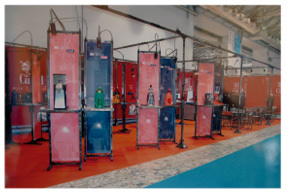 Tranquilo, Tranquilo II, Brasil and Marfil, will be the new releases for the 2009 trade fair in Milan. For the first time three separate catalogues are published for the ABS, INOX and CROM collections with a bag/folder especially for the fair. With a stand of 200m2, Cunill participates at the Exposición Internacional de la Industria de Hostelería HOST Feria Milano, presenting the new releases of the three product lines. The fair closes its doors with a record attendance of 125.000 visitors. For the first time Cunill is present on the Asian continent at the trade show, HKTDC Hong Kong Houseware Fair, where its three collections are presented in full. Kenia and Jamaica are the last two models to complete the Silencer 63dB range in the ABS, CROM and INOX collections. Such is the passion for the quietness that a specific catalogue for this line is published, accompanied by the first bag/collection especially for the fair. Presentation at the HOST Exhibition, in Milan of the full range of ABS, INOX and CROM. And the prototypes of the: ACID2 EVOLUTION. The first squeezer with a double pulp filter on the market and LUXO HERITAGE ALUMINIUM, at 55dB, the most silencer grinder in the world. Inauguration of the audiometry area with a new cabin to precisely evaluate the grinders' audiometric values. 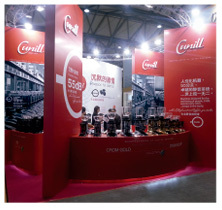 Cunill participates for the first time in the most popular fair in Asia. Food & Hotel Asia in Singapore with a 36 m² stand presenting the three complete collections: ABS, INOX and CROM and the SILENCER line. LUXO HERITAGE ALUMINIUM 55dB hits the market at the end of the year with a range of four finishes: painted in metallic grey, white (new trend) or chromed silver or gold. 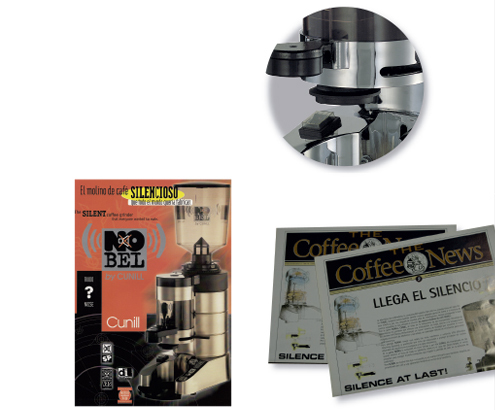 With new packaging that accompanies the world's quietest professional coffee grinder, at only 55dB. Special edition of catalogues personalised for the models: ACID2 Evolution and LUXO Heritage Aluminium 55dB which will be presented at the upcoming fairs in Shanghai and Milan. The first double pulp filter squeezers are beginning to be marketed with new packaging. 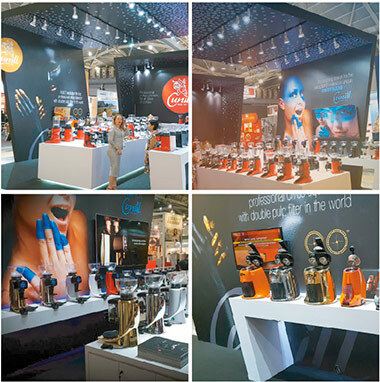 Cunill participates at the "Hotelex and Finefood Shanghai 2013" to present two new worldwide innovations to the Asian market: the ACID2 Evolution squeezer and the LUXO Heritage Aluminium 55dB silent coffee grinder. Cunill inaugurates its new and spectacular stand at Milan's Exhibition, HOST, and presents such innovations as the electronic LUXOMATIC grinder with its complete chromatic range, as well as LUXO and ACID2, attractions at this fair. This year the fair received 133.000 visitors. Cunill participates for the second time in the most popular fair in Asia where we had the opportunity to present our great novelty to the Asian market. The electronic grinder LUXOMATIC with all its colour range as well as LUXO Heritage Aluminium 55dB and ACID2 Evolution, the attractions of this fair joint with the rest of the three ranges ABS, INOX and CROM. 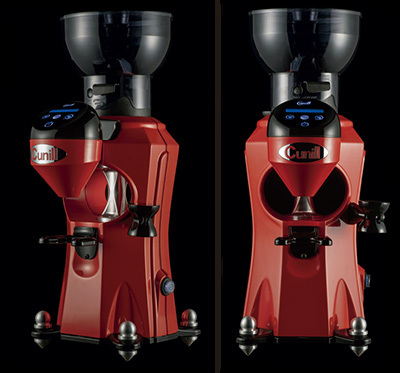 Cunill expands its production chain due to the demand of the new squeezer with double pineapple ACID-2 Evolution and the new Luxo, the coffee grinder with aluminium body. A great success. 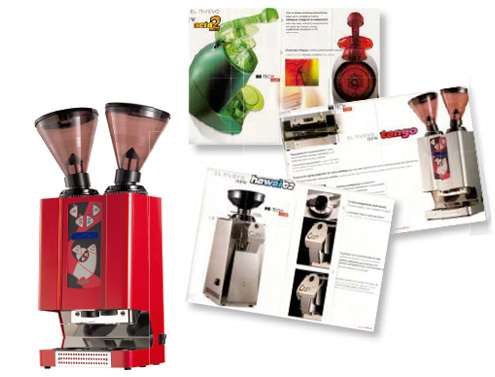 An excellent catalogue for an exceptional coffee grinder. The permanent search for exceptional makes us be unique. Cunill lets grow the LUXO family with the commercialization of its new project LUXOMATIC, the first silent electronic coffee grinder of the market. With touchscreen, created to conquer. Technology, design and silence for lovers of exceptional. Cunill is present with its characteristics and spectacular stand at the international fair HOST Milano 2015 Introducing the new range of mills On demand. Three new models: QUIET-TRON, TRON-KENYA and JAMAICA-TRON that complete together with the extended Cunill family model LUXOMATIC On Demand. The new TRON line consists of three models of our charismatic brand Cunill completing the On Demand family together with the successful mill Luxomatic. These three models, with the addition of clever digital head and the various benefits and finishes on Inox, Crom and ABS, have captivated the interest of the professional market. The On Demand family is rewarded with an excellent collectible catalogue and of course, accompanied by the "Special Exhibitions" bag, Cunill’s exclusive design. 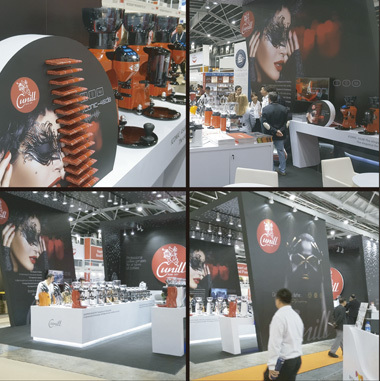 Cunill, once again, participating in the celebration of the International Fair FHA 2016 in Singapore; obtaining the great satisfaction from all visitors. Presentation of the new range of electronic grinders: TRON. Return to the corporate colour in all ABS range: RED. We celebrate our 60th Anniversary (1957-2017)! 1. Coffee grinder: 45dB of noise -- Extreme cold grinding, 'i-Conic'. 2. 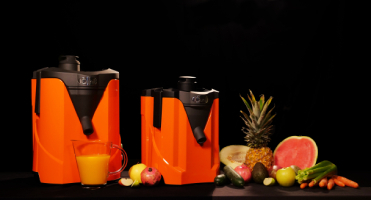 Professional juice extractors in two formats: for high and low production. 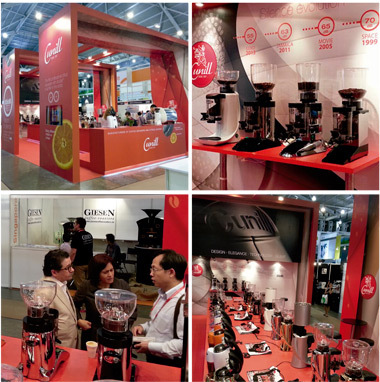 New and good sensations once again after our participation at FHA Singapore 2018. With the presentation of the highest expression in the world of coffee where cold and silence reach levels never expected.Our new grinder: iCONIC. Iconic marks the guideline to follow in the future.With Iconic, a new concept is created in coffee grinding.